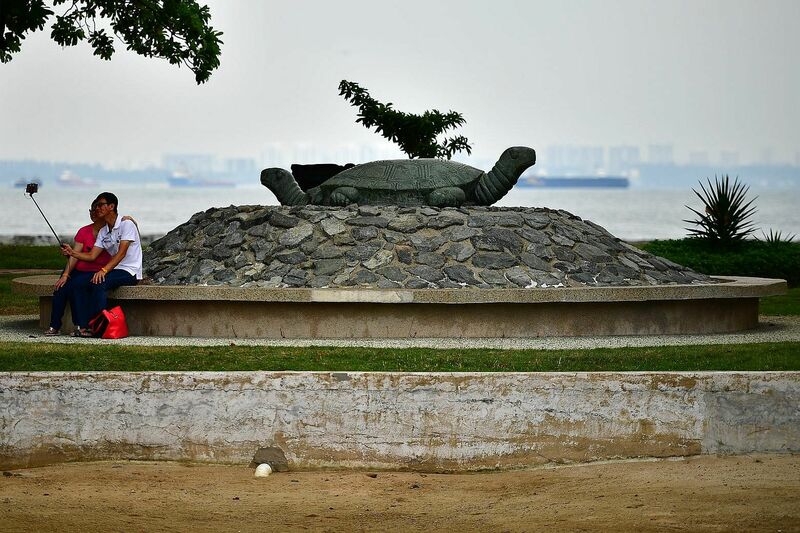 Kusu Island draws believers seeking answers to prayers. Barely a half-hour boat ride away from mainland Singapore lies an idyllic, gift-giving island - a place which has for almost a century drawn believers seeking answers to their prayers, and a place where those answers have been found. Yet, Kusu Island, home to a Chinese temple, three Malay shrines and dozens of turtles, is often overshadowed by the other Southern Islands - except for one month every year during the pilgrimage season in the ninth lunar month. This year, the pilgrimage season to Tortoise Island (kusu means tortoise or turtle in Hokkien) is from Oct 20 to Nov 17. 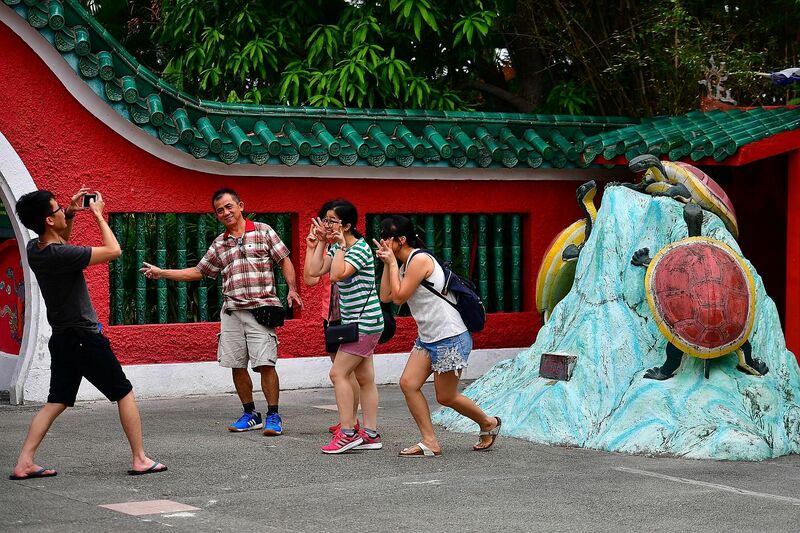 "This annual pilgrimage attracts thousands of devotees who pay homage at the Da Bo Gong (Tua Pek Kong) Temple," said the Singapore Land Authority (SLA), which manages the island. The island has many legends. One tells the story of how a turtle saved some sailors from shipwreck by turning itself into an island during the ninth lunar month. The island turned into a place of worship when sailors returned to make offerings. Hopping off the ferry from Marina South Pier, visitors will be greeted by the temple's green pagoda roofs and whitewashed walls, framed by the blue of the Singapore Strait. Picnic tables dot the lawn outside the temple, but none were in use when The Straits Times visited on Oct 25; pilgrims had headed straight to the temple. But for the devotees seeking blessings in marriage, fertility, health or harmony, the pilgrimage does not stop there. The Kusu Island Tua Pek Kong Temple is the island's most famous landmark. But the island's history as a place of worship dates back to at least 1813, before Sir Stamford Raffles first came to Singapore. In a nod to the isle's translated name of "Turtle Island", one can find stone turtle statues and a turtle pond on the temple grounds. Heritage blogger Jerome Lim said: "The temple we see today is the result of a rebuilding effort in the early 20th century - 1909 with an extension made in 1923." Anthropologist Vivienne Wee highlighted features peculiar to the temple, such as a tree dubbed the "qiu zi shu", or "ask for a son tree" in Mandarin, where devotees pray for fertility and sons. She has seen them stroke the stone turtles, and believes it is for luck. Worship on Kusu Island is also linked to the Malay keramat (or shrine) on a nearby hill, which has three graves inside. Mr Victor Yue, honorary treasurer of the Singapore Heritage Society, said Chinese pilgrims will go on a vegetarian diet on the day they visit the shrine. He said this stems from the fact that Muslims do not eat pork, and morphed into a general avoidance of meat for the day. Dr Wee said that as far back as the 15th century, the island - which used to be called Pulau Tembakul - was noted as a place for seafarers to avoid because of the reefs nearby. Kusu Island used to be two islands before reclamation, separated by a sandbar that could have posed a hazard to ships during low tide. After paying their respects at the temple, many will climb 152 steps up a small hill, upon which stand the shrines of three Malay saints. "The kramats were built to commemorate a pious family - Syed Abdul Rahman, his mother Nenek Ghalib and his sister Puteri Fatimah - who lived in the 19th century," reads a signboard. Among the many devotees was clinic assistant Candy Low, 51, and her brother, Mr A. Low, 47, who had prepared for their spiritual trip by going vegetarian for the day. "Our parents first brought us to the island about 20 years ago, and we thought we would come back and see how things have changed," said Mr Low, an administrative executive. "The area used to have a more kampung vibe. Things were more rustic, and there were more people, who come here to picnic." Mr Ishak Samsudin, 55, a sixth-generation caretaker of the Malay shrines, agreed. "There are fewer people coming here now, especially after the ferry services moved." Clifford Pier closed in 2006, and all ferry services were relocated to Marina South Pier. "Back then, people would come after work in their suits and ties to pay their respects, but it was more inconvenient when the pier shifted," he said. Figures from SLA show that over the past five years, about 42,000 people visited the island during the pilgrimage season each year. This is a decline from the island's heyday in the 1990s, when more than 200,000 thronged the island during the season, according to a 2014 Straits Times report. But Mr Ishak is confident that the island pilgrimage will always have a place in Singapore's history. "The island is located in the Singapore Strait, (like a presence that) takes care of the shipping lane, and it is where many people have been coming to pray. We should learn to cherish this part of our history and heritage before it's gone," he said. The amount of effort that people take to go there makes it something special. Other than being rich in history, culture and spiritual elements, the pilgrimage is also a reminder of Singapore's intimate connections with the archipelago... We often forget that Singapore has this maritime aspect. DR CHUA AI LIN, vice-president of the Singapore Heritage Society, on why the Kusu Island pilgrimage should be celebrated. SCAN TO WATCH Kusu Island draws believers seeking answers. Dr Chua Ai Lin, vice-president of the Singapore Heritage Society, said the pilgrimage is one to be celebrated. "The amount of effort that people take to go to go there makes it something special. Other than being rich in history, culture and spiritual elements, the pilgrimage is also a reminder of Singapore's intimate connections with the archipelago... We often forget that Singapore has this maritime aspect." She noted that people would pay respects to deities of different ethnic backgrounds and religions. "It is a fabulous, living example of Singapore's long history of multicultural and multireligious existence."